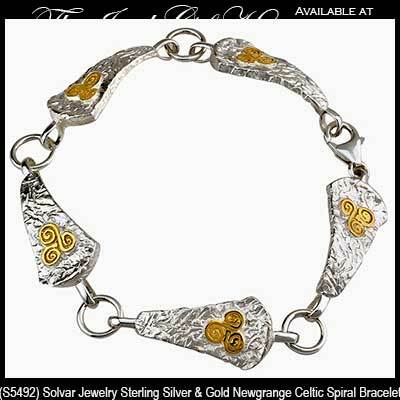 This sterling silver Newgrange bracelet features Celtic spirals with yellow gold accenting. This Newgrange bracelet features beaten sterling silver links along with 14K yellow gold accenting. The five link Newgrange bracelet measures 1/2" wide x 7 1/2" long and it includes a lobster claw catch. 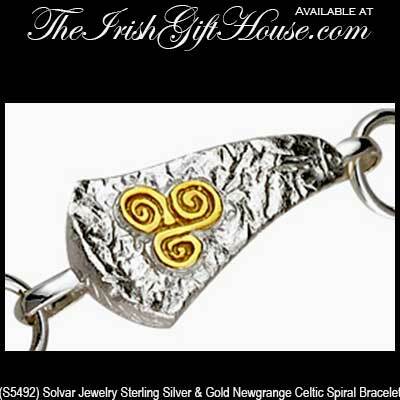 The Celtic spiral bracelet is made by Solvar Jewelry in Dublin, Ireland and is gift boxed with a Newgrange spiral information card that is complements of The Irish Gift House. This sterling silver Newgrange necklace features Celtic spirals with yellow gold accenting.